boys - adventure! Growing up I did everything I could with a 1970’s steel wheeled skateboard, a BB gun and my imagination. Eventually, I surfed my way through a California oceanside college, dated many girls and have spent many nights staring at the stars. Eventually, I did grow up and since, owned businesses, become a pilot , produced television and served my Country. Respectfully, It is only fitting that I would eventually find my way (or did it find me? 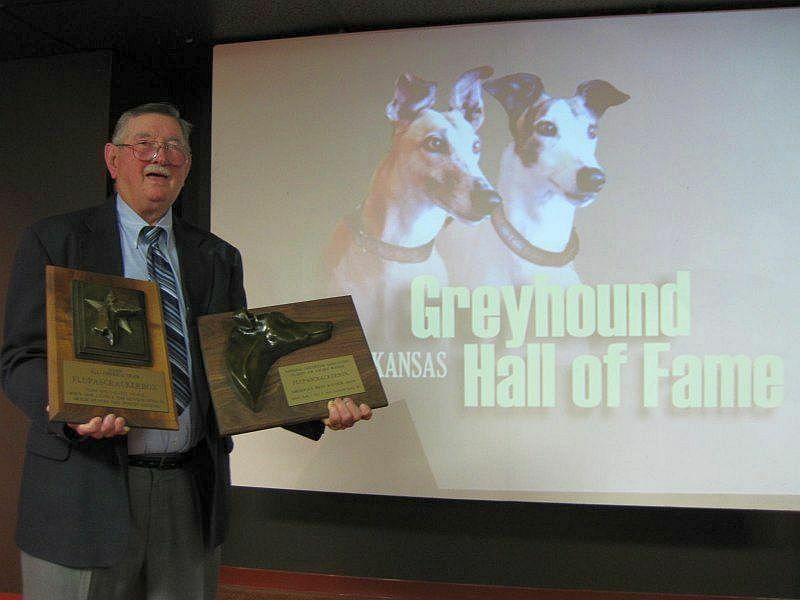 ), in the wildly adventurous and sometimes, emotional sport of Greyhound Racing. Being a mere “pup” to the sport and as green as a greenhorn gets, you can imagine how much about greyhound racing there still is to learn. Having said that, when I was recently asked to research and write about the 2009 Flashy Sir Award recipient, my response was, a resounding “yes”, then following a pause, I asked. “Flashy what, award”? Greyhound. I read of Flup’s highly appraised trainer JT Riley and finishers, John and Dawn Bladen. Mr JT Riley accepting the awards for Flupascrackerbox. The Internet was filled with public praise and awe over his amazing career amongst which he achieved All-Time Career Winner at Southland and The Southland 2009 Dog of the Year. There was much public praise of his back to back 2008 &2009 All American Razorback. There was congratulatory blogs and postings for Flup's 2008 Festival of Stakes victory and accolade after accolade for being the 2009 North American Win Champion with 47 victories and of course, the 2009 Flashy Sir Award. to discover that while yes, the dogs are trained how to go around a track, what to chase and when to chase it, they are not trained on how to run. Running is just what greyhounds do and they do it for the absolute love of running. Flupascrackerbox more than ran, he flew! Like a bird is to flight or a caterpillar destined to become a butterfly, Flupascrackerbox was born to run! Like the grace and beauty of an olympic sprinter, rounding the track with prideful determination, with their muscles rippling under the strain, that was Flupacrackerbox. lasting and profound impression on a man he never met, 3000 miles away in California. Congratulations Sir Cracker, you’ve are amazing. It takes a lot of Team Work to marvel with all Cracker has done. Here are someof the big thanks to the following. Kevin and Heather for bringing Dave the Dog n Pa's Shawnelass together and implementing their plan and bringing it to fruition. John and Dawn Bladen for raising and finishing "Sir Cracker" and allowing him to have a fantastic start to his career. J.T. Riley for keeping "Sir Cracker" in top training shape and for allowing a long and enduring career for Cracker. I honestly feel J.T. 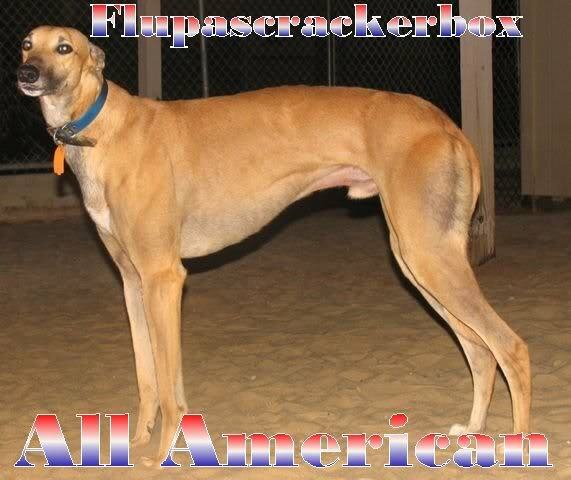 had Cracker at the top of his game every time Cracker graced the Race Track at Southland Greyhound Park. Dave the Dogcaller for calling Cracker's racing career at Southland with excitement, passion and his special moniker of "The Champ"!! 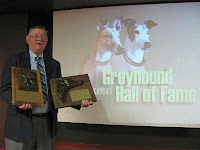 A special congratulations to David Flora and all the Team Greyhound Owners which include Kevin Fish, Frank Ferrentino, David Ruiz, Thomas Misiker, Brett Horyna, Richard Coffee, Duane Bracken, John Reedy Jr., Ludwick Lohnes and Grant Cohen for being involve in Crackers career and participating in all of Crackers achievements and his long journey toward racing mortality. Congratulations "Sir Cracker" it's been a hell of a ride!!! We have enjoyed it! !